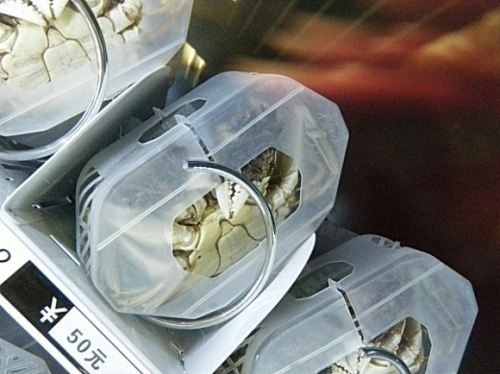 Located in the Xinjiekou subway station, in Nanjing, China, this particular vending machine is full of live hairy crabs and crab vinegar, making it available to enjoy seafood on the go. The quirky food dispenser was installed on the 1st of October, and at first, it surprised even the Chinese. People would stop and stare at the crustaceans inside, and others would even take out their cameras and take photos of them. Business was out to a slow start, with only one hairy crab sold per day, but as people got used to the thought of buying live crabs from a vending machine, the figures jumped to an impressive 200 crabs a day. People noticed they were cheaper than the crabs found at the local food markets, and buying them on their daily commute they also saved precious time. Depending on size, crabs can be bought for 10 RMB, 12 RMB, 25 RMB and 50 RMB. They all seem dead, but their actually just hibernating due to the low temperature in the vending machine.